I wanted an egg sandwich for breakfast this morning, but the only bread we had was a hamburger bun. 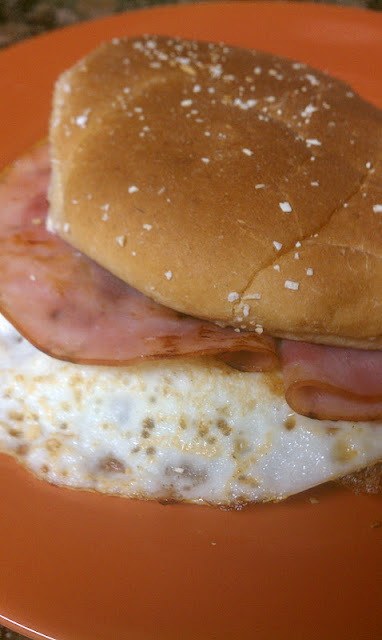 A few weeks ago I used sausage and eggs to make my Breakfast Hotdog, so I thought, why not make a breakfast hamburger. It was a great way to use leftover buns. For lunch today, I also used up a few other leftovers in the fridge. (I hate to waste food!) 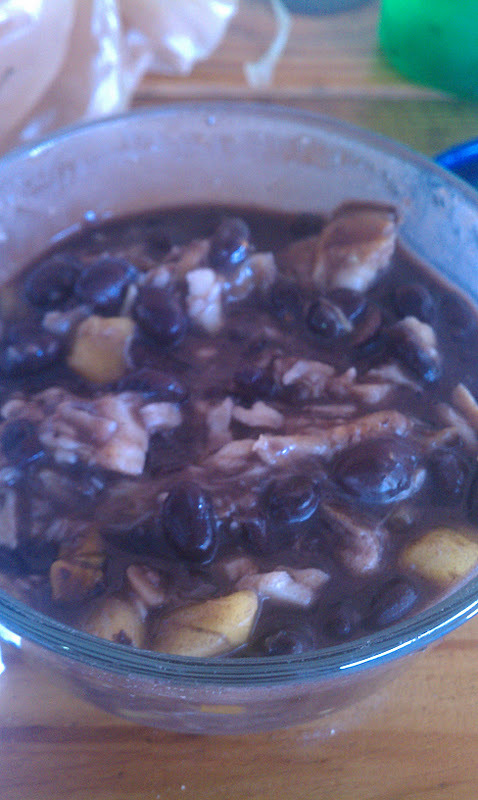 The other day, I made Grilled Fish Tacos and Black Bean Soup. I added the small piece of fish we had left with the rest of the soup and mango. 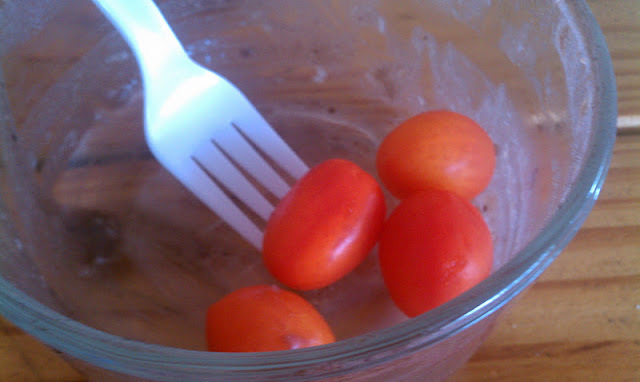 I enjoyed my leftovers with grape tomatoes. I almost ate them all before I took a picture. Today at work, some of the girls were talking about their appointments at the Laser Hair Removal Office we refer patients too. I asked if we get a discount, and they said yea... 100% off! WHAT?? I plan to make my appointment first time in the morning. Huck was really excited too. I keep telling him I want laser hair removal and now he doesn't have to pay for it :) I'm scared it will hurt though :\ I need to do some research! For dinner Huck picked up some Porterhouse T'Bones from Publix. I know we eat to much steak, but Huck does a great job marinating them!! I served our steak with Brussels Sprouts and Potatoes. I like my steak rare to medium rare. The only way to eat it!! Cook bacon in oven at 400 degrees until the desired crispiness. Reserve 1 Tbsp of the bacon grease and add to pan on medium heat. Add Brussels Sprouts and onion to pan and cook for 5 minutes or until sprouts start to brown. Add mushrooms, bacon, and garlic and cook an extra 10 minutes.